Timmy’s world has been destroyed. Timmy won the world wide competition for the much coveted trip to Santa’s Workshop. His entry, like the billions of other entries from the world over, was why he wanted peace on earth, what he’d do if he were the President of the United Nations, and why wired hair dachshunds are the best dogs in the world. 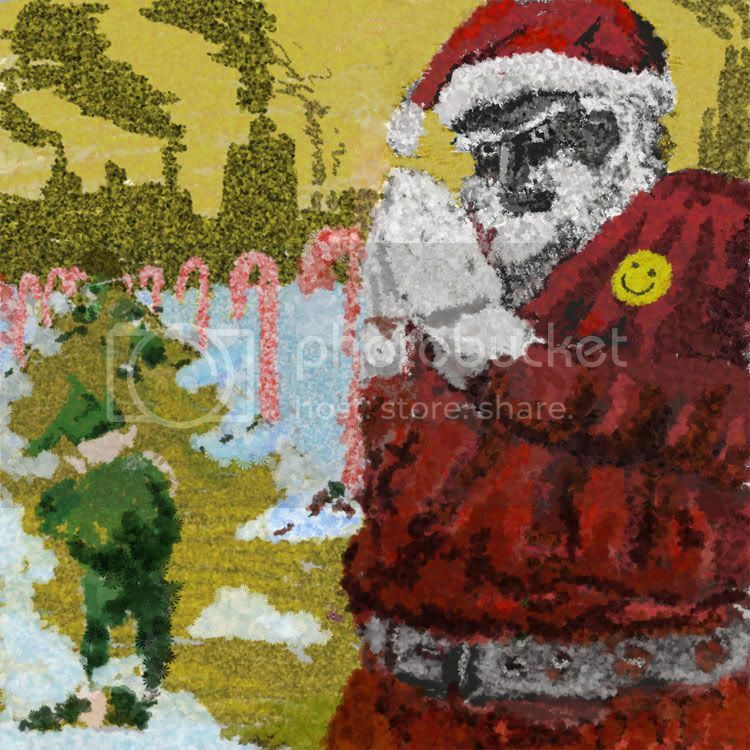 Upon arriving at the North Pole, Timmy found that “Santa’s Workshop” was, in fact, an industrial wasteland of name brand products being mass produced by megalithic multinational merchandising subsidiary companies handed no-bid contracts by Santa, Inc. Items "crafted" in Santa’s sweatshops hadn’t seen native workers in years, the workforce having either been imported from warmer regions or, in most cases simply outsourced. 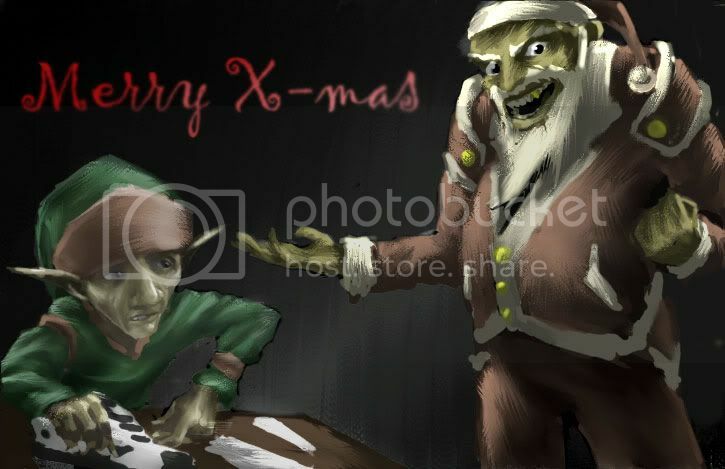 The native elf population was all but forgotten, disenfranchised and living in hovels, getting drunk on eggnog and selling black market “candy” canes just to survive on the seedier edges society. Santa’s Village, the sprawling metropolis of loose morals, iffy ethics, high prices, and merrily twinkling Christmas lights, loomed over all. 2. Timmy, just off the plane. 3. A displaced Elf worker. Last edited by S.C. Watson; December 25th, 2005 at 11:45 AM. multiple votes, so i voted multiple times. I was 3 minutes late finishing so my entry didn't get in. Here's mine. Rushed the background to try and make it in on time. I must have mixed up the CoW deadline with the Chows. Anyway, I am pretty new to conceptart, and this is my first Weekly contribution so C&C is welcome. Everyone else did amazing work for this topic. Thanks for slipping me in Oregano! Last edited by Zephrym; December 25th, 2005 at 02:26 AM. Gotta go for jeffZNY. 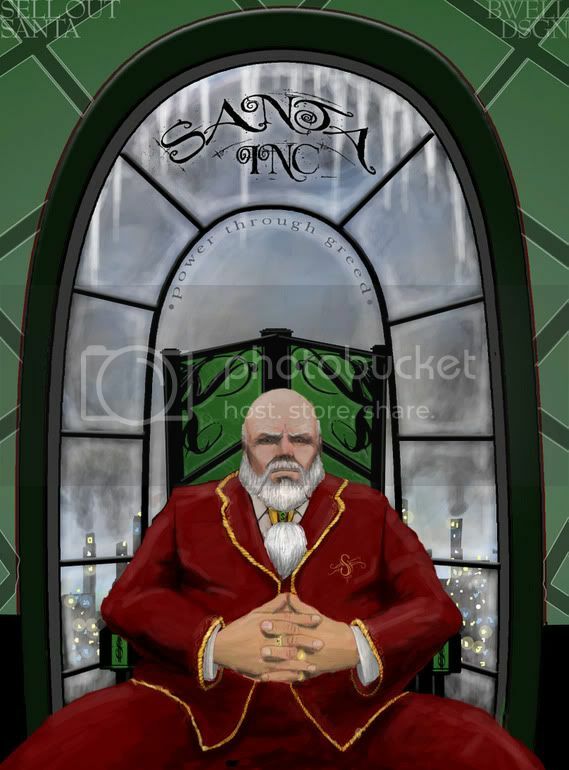 I love the santa looking like Scrooge. glad you enjoy this one. this round my vote goes to... no one. 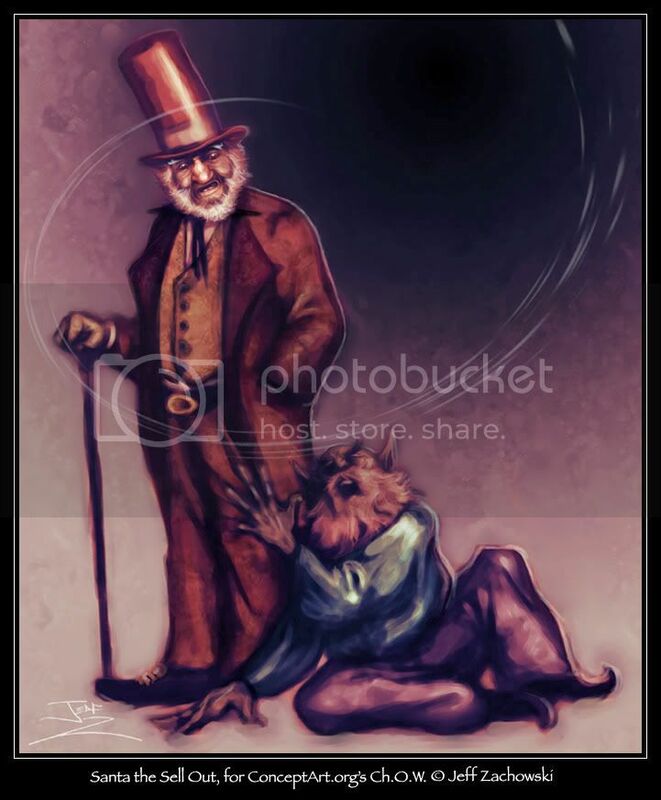 very nice works, but that`s about it. I went with Tiegrob's - Great expression and line quality. Everybody else did great. Glad you found the time to do this during such a busy time of the year. (In some parts of the world). In response to Trollboy from previous thread: Thanks dude! great works, all of ya! Ahhh Oregano you should really take mine out of poll if that is possible. Not that it will get any votes, but it is super unfinished. I had a new baby nephew born and my birthday yesterday to deal with, and xmas on top of that! AHHH! Craziness ensues. I'm gonna have to go with Romance on this one, and Chuck,mate as well. Both rendered very nicely. I like the cool "seedy" colors going on in Romance's piece and the warmer tones go well with Chuck's money-grubbin' Santa. jeffzny got my vote for this round....good emotion on both faces. runner's up: romance and chuck,mate! my vote goes to Romance, nice execution and great character. Tei, awsome drawing, though it would have been sweeet to see it in colour. I thought Chuck, mate's was too good. Got my vote. Vote goes to Chuck. But I thought Flip, Azrael and Trollboy caught Santa's mood really well too. Zeph, Fez and Romance's elves were wicked. I'm actually kinda disappointed no one thought of an array of clocks with the time tuned to the countries that were being outsourced to the most (ie China, Vietnam, Pakistan and so on) behind Santa in his office space. Great job everyone. Couldn't make this one on time....the lure of sushi buffet was too great. Chuck, mate and fes got my votes. Very well executed, and the Santas look satisfyingly nasty. bumskee - you never give up on me do you? Next time. Very good works.... I gave my vote to Chuck Mate.. I think he really deserved this one... Great work Jeff.. nice to see you posting.. I went with Romance and Chuck,mate this time. I went with fez and Chuck,mate on this one. fes you captured the discription really well. Chuck, you did a bitchin job with your entry. Well executed. thank you very much guys. appreciate it. entries from me (in any activity) for some time. Trollboy, VirusArtist, Jska, Redehlert, Bumskee, Darth Massacre, Fes, Asoir & everybody who voted and participated. What's everyone think of this multiple voting thing? I'm definitely not a fan. I looked at the way the votes were panning out, and ultimately decided I couldn't vote at all. Personally, I have no problem just biting the bullet and making a decision--it's not life or death afterall. But to just register one vote, I suddenly felt like I was doing an injustice to just inflate one artist's count when others seemed to be spreading votes around to practically everyone. It just seems like such a chaotic system with a seemingly infinite number of potential votes out there for a finite number of voters. I don't know, I'm probably the only one who handled the problem by simply abstaining, but I just personally can't cast a vote in a system like this...there's just something about it that is completely contrary to my mind. oregano - i`ve notices that my Santa piece got lost. to have something to show. CHOW Red Sonja, I hope I'm allowed to put this on here.